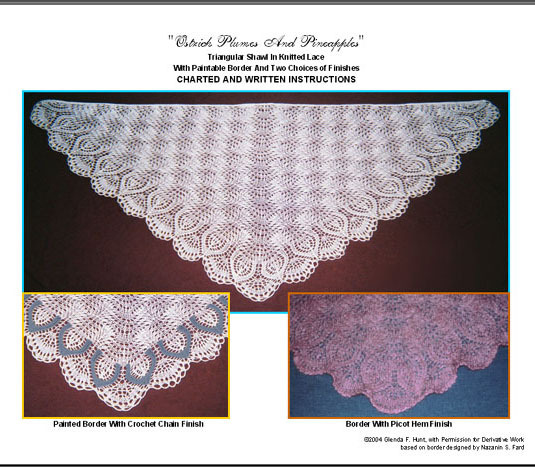 This knitted lace pattern looks complicated but is good for beginning lace knitters. The pattern is one that also looks good in variegated yarn. The instructions are pdf format, in both written and charted form. Gauge: 16 stitches x 32 rows = 4.25” x 5.33” in Main Pattern (= Multiple of 16 stitches + 1 x 32 rows). Crochet hooks U.S. Sizes I/9 (”eye”) (5.5 mm) and F (4.0 mm). For Picot Hem Finish Only: Yarn needle and stitch holder. Construction Overview: The shawl is worked from the center back neckline outwards to the border. The border can be finished with crochet chain loops or a picot hem and, optionally, painted with textile paint. To Lengthen Or Shorten Shawl: Work more or fewer complete vertical repeats of Main Pattern.